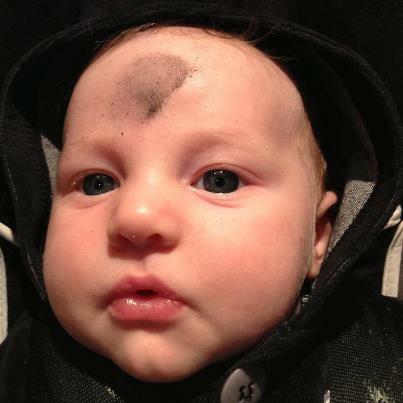 The poignancy of Ash Wednesday struck with quite a blow this year. I had on one side my nearly 2-year-old girl and on the other my new baby boy. The rhythm of the liturgy Proceeded as usual, my sweet little girl chiming in with her hearty “amens” either just before or after the beat. “Come, all is made ready” rang the familiar call and papa with daughter and I with my freshly-born son stood to make the journey to the High Place. We supped with God and then the brutal truth blazed before us: ashes would today be our crown. We, as Adam, would be banished from the Garden. The striking part this year was in my arms. My son, a month old in this world, who has as far as I know, committed no volitional sin – he too bore a black cross, the symbol of his grave. “From dust you are and to dust you shall return”. How can this be? This cherubic boy’s face marred with the mark of a sin-stained soul? I looked to my left, finding it quite easy to believe such guilt lay in my spirited and stubborn girl, easier still to know many sin-lived years in papa & I, but more difficult to see it in this helpless child asleep in my arms. Yes, even he needs ashes. His soul needs reminding of sinful mortality. He is as needful of a Savior as his papa, mama , and sister. Praise God from Whom all blessings flow, the Font of my son’s redemption. Thankful that my son has been cleansed by Christ, I descend the Hill with a new light shining to the depth of depravity.